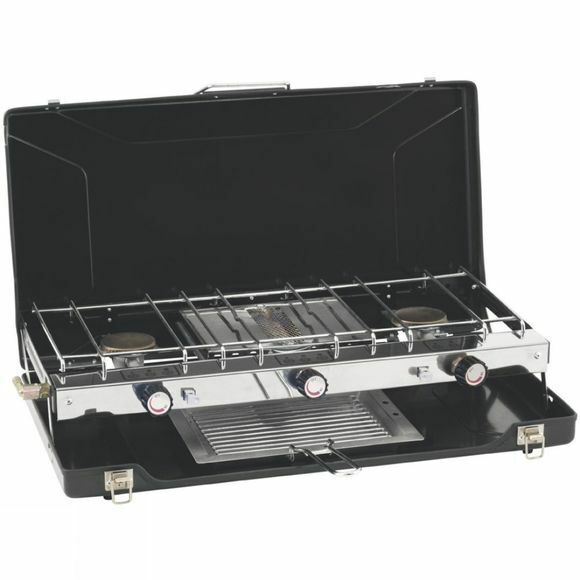 The Appetizer 3-Burner Stove with Grill from Outwell is an excellent piece of kit that will have you feeling like the Jamie Oliver of the campsite. With three 1500-Watt burners and a 1300-Watt grill there are few meals too big to be cooked when enjoying your camping cuisine. Getting it started is easy with individually controlled burners and auto-piezo ignition to ensure you only use what you need. There are anti-slip rubber feet which help to keep the stove steady and still so as not to loose your luxurious lunch to the floor, whilst a windshield protection helps to maximise the efficiency of your stove, even in less than perfect conditions. The whole thing is pretty robust and packs down relatively small making it easy to store when it isn't in use and equally convenient to travel with.